Posted on July 25, 2018 July 25, 2018 by Margaret & filed under Growth/Inspiration, Inspiration. Some things happen in life that haunt you forever. Sometimes that’s a good thing. In the 1990s, a dear friend gave birth to a beautiful baby boy. She needed to buy a gift at a now-defunct hobby shop and took him with her. As she walked up and down the aisles with baby in her arms, the store clerk, a young woman, approached her. She was very interested in the baby. Manic and yammering, she invaded mother and son’s personal space, cooing away. It went beyond the typical reaction to a baby. My friend’s gut warned something was off. Yet, a few moments later, when the woman asked to hold the baby, my friend, with everything screaming noooo!! !, handed him over because she felt embarrassed not to. 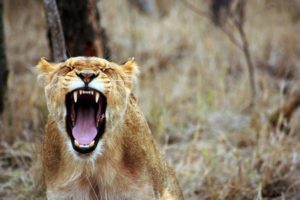 In the instant she did, her inner-lioness roared. She realized her mistake and became anxious as the clerk started to walk away. Fearing the woman would run from the store, she followed close behind and finally coaxed her to give the baby back. Back in the parking lot, she sat in her car and sobbed. When my friend related that story to me the next day, my eyes went wide. I didn’t have my son yet, and it wasn’t that part of the story that was the scariest. After all, I knew it had turned out well. What really terrified me was how someone so strong, and my friend was that, could so easily give up her power. It alarmed me because I knew I had done the same thing on many occasions. That was my wake-up call. Unfortunately, we wake up and we fall back asleep. We’re human, after all. Years later, I sat in a doctor’s office with my own baby. My gut told me one thing. The doctor poo-pooed it. I persisted because I knew my baby better than the doctor who saw him once or twice a year. In the end, the doctor convinced me all would be well. It wasn’t. I found myself in the back of an ambulance with a limp baby after a frantic 911 call. This was my personal “haunt you forever” moment—one for which I haven’t completely forgiven myself, though my son is a healthy, young man today. Even in the moments when it all turns out okay, you still have to deal with the fact that you let yourself down. I imagine that’s exactly what some of the people captured in Sacha Baron Cohen’s show Who is America? feel at this moment. At least, I hope they do. That wretched feeling induces growth. For those who haven’t seen the show, it is difficult to watch—cringe-worthy, disgusting, and often hard to believe. After seeing clips, some friends were convinced it was a spoof with actors. It’s not. People were “tricked,” their words, into doing and saying things that have cost them their reputations and jobs. But there was no coercion. For whatever reason, elected representatives and people in influential places willingly entered into a circus that was really just an externalization of their own mindset. I understand the embarrassment and shame they feel in hindsight, but rather than complaining that they were tricked and don’t really believe the views they expressed, they should focus instead on what made them act in such a manner. For some, the answer no doubt is because they really do believe the things they stated. For others, it’s because they weren’t strong enough to stand up for their beliefs and just say no. This is an opportunity for the latter to strengthen their muscles of principle. The internet never forgets, but human beings love people who admit they were wrong and change their lives for the better. Over the past year, we’ve seen people step up to reclaim their power. One of the more gasp-inducing examples was the #MeToo Movement, when women—and men—who had been sexually assaulted or harassed bravely came into the spotlight. And then, 141 women, violated by USA Gymnastics national team doctor Larry Nassar, took the stage at the ESPY Awards. The visual was a punch to the gut. I wept for the children they once were but also because they had claimed their power. As children, they weren’t responsible to solve this horror on their own. The many adults who they confided in forfeited their power to expose the crime and abuse. Only they know why. May they resist the urge to deny the part they played, dive deep into the shame they undoubtedly feel, and resuscitate the personal power that resides within them. Only then is there a chance that something of this magnitude will not happen again. Every day, we find ourselves in situations where our voice or action can make a difference. How many times do we nod or smile nervously when someone spouts a racial or homophobic slur in conversation because the speaker is a person in authority, a stranger, or a friend of a friend at a cocktail party? Growing up in a homogeneous neighborhood during the 1970s, I heard my share of such slurs. Sometimes I spoke up; sometimes I didn’t. In the latter case, I told myself “what’s the point, he isn’t going to change his mind anyway.” I no longer agree with that argument. It’s not about changing someone’s mind. It’s about staying true to your principles and beliefs and standing as an ally to those who are persecuted. In this moment of disagreement and discord, there is one thing we can agree on: we are living in crazy times. Social media magnifies what happens in our world, good or bad. It’s easy to get on our high horse and condemn, point fingers, mock. However, we must use our time and energy to expose the wrongs so they are righted, bolster the persecuted so they are restored, and continually reflect on our own shortcomings to reclaim our personal power and be part of the solution. Tagged as #MeToo, ESPY Awards, Larry Nassar, lgbtq, Olympics, personal power, power, racism, Sacha Baron Cohen, Who is America? Really enjoyed this post, Marg! Timely and thought-provoking. Thank you. Bravisima. This is your calling, my warrior writer. Thanks! But no thanks! LOL. Loved this post, Margaret?? Can I share on my Facebook wall? Thank you, Kathleen. Feel free to share. Yes, profoundly true Margaret! Thank you for this enlightened perspective. This holds true most especially for woman, but men as well. It’s astonishing that even in the current moment these behaviors continue to be modeled and perpetuated. I would say this ~ people such as yourself and the likeminded…. were meant to experience these precise feelings of “powerlessness” to effectively change it. Not by falling victim to circumstances but to bring effective awareness and reduce the false sense of shame and guilt that so often accompanies it.